Now that you've logged-in to the website and acquainted yourself with the component blocks that comprise a Member Profile, you're almost ready to create your own. But before you create your new profile page, here's what you'll need to know about entering text in the Drupal backend. The Fellowship website runs on a platform called Drupal. The backend for text entry might seem a little complicated at first, but with just a little practice you'll quickly get the hang of it. At the top of the text entry area, enter your full name to use as the title for your Member Profile. Enter your first name in the next field. This field will be hidden. Do you see the text entry guidelines in small print beneath the field? Look for these text entry tips before entering text in any field. Enter your last name. Again, do you see the text entry explanation, located just beneath the field? What is "All Souls"? Under the Resources tab, you've probably already seen the All Souls index described as "A simple list of every person identified as an author, editor, translator, or some other contributing role on the website. Click any name to see the associated pages." What is a taxonomy? A "taxonomy list" compiles every page on the website tagged with a given "taxonomy term." In this case, your name is the "taxonomy term" in the "All souls" taxonomy of personal names. 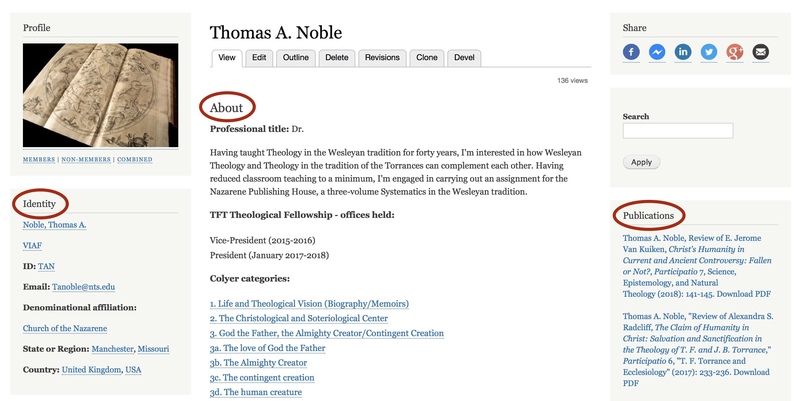 An "All souls" taxonomy list displays every page in the website where a given individual is tagged as an author, editor, translator, or contributor in some role. 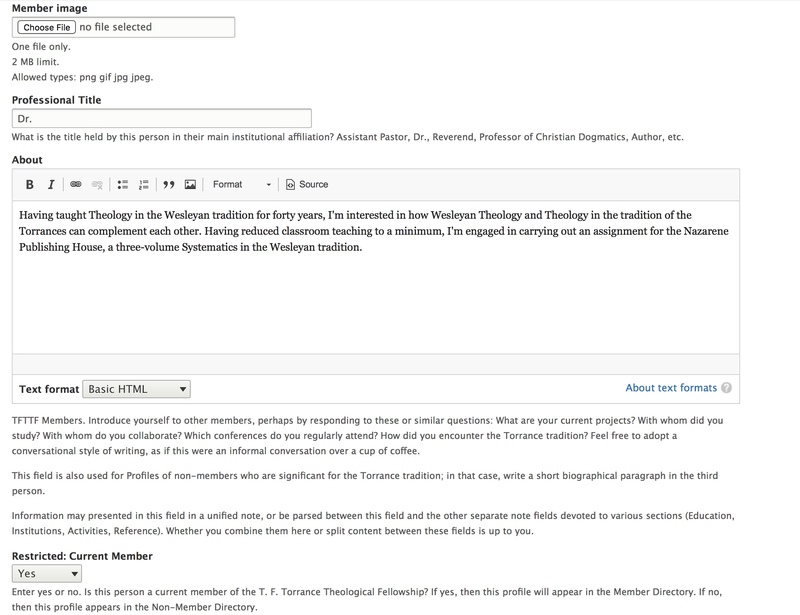 Once your name is entered in the All Souls field, your Member Profile will be linked to other pages across the site (including publications) that also contain your name in any field using the All Souls taxonomy list. See the Tutorial for tips about the various taxonomy lists used in the website and how to use taxonomy terms to navigate between resources. How do I enter text in a taxonomy field? Enter the last name first, such as "Torrance, Thomas F." For this field, as for any taxonomy field, enter a single word or two, and then wait to see if the desired term appears as a possible selection. Try to avoid creating duplicate terms, if possible, which will have to be later de-duplicated, one-at-a-time, by hand. Yet after waiting a moment or two, if the desired term does not appear, then enter it in this field and it will be added to the taxonomy term list when you save the record. Enter your initials in the ID field to create your own person ID. 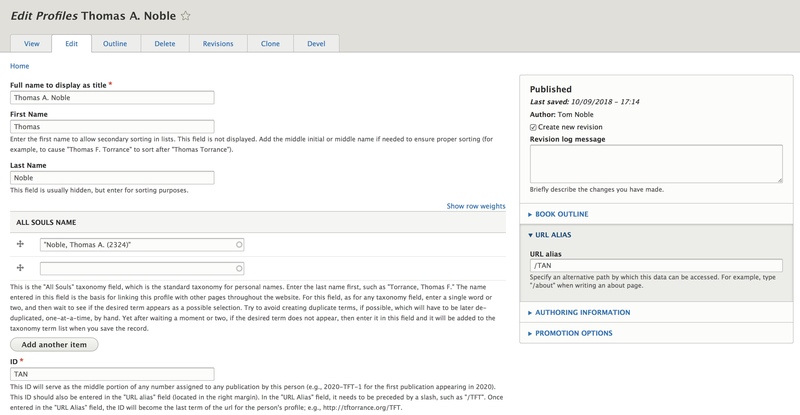 In general, the ID serves as the middle portion of any publication ID (e.g., 2020-TFT-1 would be the publication ID for the first publication by Thomas F. Torrance to appear in 2020). The same person ID entered in this field should also be entered in the "URL alias" field (located in the right margin). In the "URL Alias" field, it needs to be preceded by a slash, such as "/TFT". Once entered in the "URL Alias" field, the ID will become the last term of the url for the person's profile; e.g., /TFT. Compare the descriptions just given here with the text entry guidelines found beneath the fields. If you feel this makes sense, you're ready to edit -- go for it and create your profile page! Why not upload a photo of yourself? That will help others recognize you at conferences, etc. 2MB limit; jpg or png recommended; not tif. What is your current position? What title is most descriptive of what you currently do? TFTTF Members. Introduce yourself to other members, perhaps by responding to these or similar questions: What are your current projects? With whom did you study? With whom do you collaborate? Which conferences do you regularly attend? How did you encounter the Torrance tradition? Feel free to adopt a conversational style of writing, as if this were an informal conversation over a cup of coffee. This field is also used for Profiles of non-members who are significant for the Torrance tradition; in that case, write a short biographical paragraph in the third person. This field is the general Notes field for the About block. Other blocks have their own Notes fields. Information may presented in this About Me field in a unified note, or be parsed between this field and the other separate note fields (Education, Institutions, Activities, Reference). Whether you combine them here or split content between these fields is up to you.